For reasons I don't quite grasp, the gangsters in Yasujiro Ozu's “Walk Cheerfully” (1930) like to perform choreographed dance moves, a group twirl finished with a jaunty “Oh snap, how do you like that?” gesture. They don't care that they're in a silent film; they're going to perform a nifty number for everyone to enjoy. It's a hint that even though our main character is an imposing thug nicknamed Ken the Knife (Minoru Takada) this isn't going to be the most hard-boiled of crime flicks. That's because Kenji (the Knife) barely qualifies as soft-boiled. 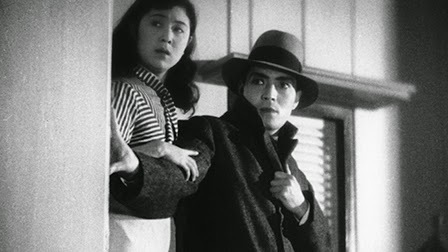 He pulls off penny-ante thefts with his faithful henchman Senko (Hisao Yoshitani) but doesn't put up much of a fight when the new woman (Hiroko Kawasaki) he falls for demands that he go straight or else forget all about her. If you are one of the many viewers familiar exclusively with Ozu's sound films, it is obligatory to warn you that you are about to be shocked, shocked I tell you, at what you will find in this new three film set from Criterion's Eclipse series: elaborate camera movements, shots from high angles and medium angles, and even chase scenes. “Walk Cheerfully” begins with a hectic example of the latter though it ends peacefully enough with Senko and Kenji walking away from an accusing crowd feeling triumphant and relaxed. 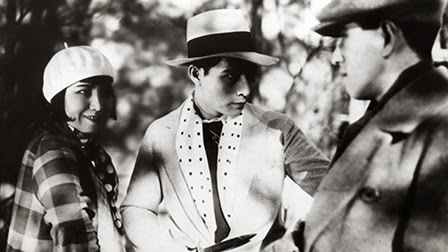 Ozu will dial up the tension, though, as the happy hoodlums are forced to question their complacent ways by the arrival of Kenji's new love, who is as much a problem for doting Senko as for Kenji's jealous moll Chieko (Satoko Date), coiffed in vintage Louise Brooks bob. 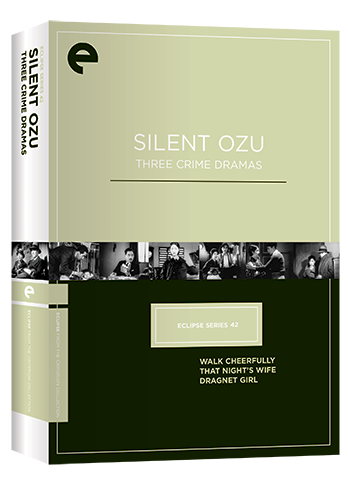 Like all of the films in this set, “Walk Cheerfully” reflects Ozu's love of American cinema; American movie posters adorn the walls, English words feature prominently in the background design and everyone is dressed in stylish Chicago mobster suits and fedoras. Genre cinephilia was not an invention of the Nouvelle Vague. The real strength of “Walk Cheerfully” is in the characterizations that prove to be more layered than is typical of a gangster film of this (or any) era with sidekick Senko being particular memorable in his eagerness to adapt to whatever lifestyle choices his boss makes. The story, however, proves to be a pretty formulaic redemption tale (with enough intertitles to make this silent seem a bit too talky) which made the film a mildly disappointing way (compared to my sky-high expectations for any Ozu) to kick off the set. 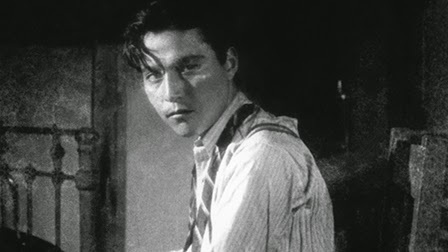 That changes with the second film, the efficient, moody and all around spectacular “That Night's Wife” (1930). The film kicks off in the blackness of a city night with police shooing away the homeless; they will burst into more frantic action when they catch report of a brazen robbery that leads to a manhunt that dominates the first half of this short 65-minute film. The target is Shuji (Tokihiko Okada) who, after fleeing his crime scene (punctuated by a dolly in to a bloody handprint on the door! ), clings desperately to the shadows, but comes fully into relief in a spectacular scene staged in a phonebooth (oh, cinema has lost so much with the shift to mobile). His face drenched in sweat, Shuji cowers in the booth while we see the feet of the officers shuffling through the streets a short way away; these close-ups function almost like sound-effects on the comic book page, adding sensory depth to the silent proceedings. He is calling to check on the health of his critically-ill baby girl who is being tended to by his faithful wife Mayumi (Emiko Yagumo). A doctor establishes a classic deadline for him: “You must return home tonight!” Shuji can practically hear his bed-ridden daughter crying for daddy (we get to see it in heartbreaking fashion) and heads home though he knows it will lead to his doom. The first half of the film is dictated by the rhythms of the chase; the second half is all stasis, and manages to be even tenser. A detective ( Togo Yamamoto) shows up at the family apartment to take Shuji into custody, but the protective mama bear winds up holding two guns on the copper while insisting that her husband be allowed to stay with his sick child through the night. In typical Ozu fashion we soon learn that the detective is a man of great compassion rather than a cardboard cutout. The camera explores every nook of this tiny apartment; one series of shots pans right to left over several still-life compositions of bric-a-brac, then reverses direction to show both the passage of time and a surprising shift in power that has occurred in the interim. This entire film is so very much alive and so very real (I think Ozu and Satyajit Ray created the most authentic characters of all-time) and the ending surely qualifies as “transcendental” by Paul Schrader's definition. If Ozu doesn't top himself in the next film in this set, he at least comes close. “Dragnet Girl” (1933) is expansive where “That Night's Wife” was more carefully circumscribed. A few years (and many films) later, Ozu's camera work and editing are quite advanced, but the credit for this film's success belongs in no small part to a finely-nuanced script by Tadao Ikeda (from a story by James Maki). Though she is the title character and the first important character we see, young Tokiko (Kinuyo Tanaka) quickly recedes into the background as yet another jealous, small-minded gangster's moll. She's destined to be cut out of the picture when her tough-guy boyfriend Joji (Joji Oka), an ex-boxer turned career crook, falls for the sweet, innocent sister of a new young hoodlum in his gang. But it's all a clever trick. This will indeed be another story of redemption, but it will play out in a wildly divergent fashion from “Walk Cheerfully.” Tokiko initially seems content to be a stereotype as she confronts the new girl at gunpoint, but an abrupt transformation occurs. Tokiko will be the one to change and she, not little Miss Trueheart, will be the primary agent of Joji's presumptive rehabilitation. In a sincere and deeply moving scene, Tokiko makes herself completely vulnerable to Joji: “Love me more!” It's pitiful in the literal sense of the term and Joji both takes pity on her and on himself. What an amazing way of shifting both the emphasis and the sympathy in the story; this needs to be in a screenwriting textbook somewhere. Admittedly, you might groan when the hackneyed line “We'll do one last job” casts its doomed shadow over the proceedings, but darned if, after a brief period of delusion, the couple doesn't realize just what a rotten idea they've come up with. I guess they had seen as many movies as Ozu. Auteurists can't help but study these films for the signs of the Ozu that was to come, but perhaps it's better to focus on the Ozu who was, not yet 30 and intoxicated with both American films and the craft of filmmaking. He was certainly refining the techniques that would make him one of cinema's greatest masters, but he was clearly also just having himself one hell of a good time. And just a few years into his career, he wasn't a half-bad little director either. All three films are presented in a 1.33:1 aspect ratio. Eclipse is Criterion's no-frills sub-label so these SD transfers have had little, if any, restoration. “Walk Cheerfully” shows considerable deterioration in many scenes, with staining and other debris visible throughout. “That Night's Wife” is slightly-less damaged but still shows advanced degrading in image quality which is most problematic in night-time scenes that look even darker than they were meant to; surely we were meant to see more in scenes where we can just barely pick out the shadow of a tree. Still, the images are intact and show enough detail to provide some striking close-ups and to make out the sometimes elaborate background décor. “Dragnet Girl” is by far the best of the lot. It has its share of dirt and debris but little of the overall deterioration of the other two transfers. In general, these films look their age but they're strong enough to be fully appreciated. These three silent films are all accompanied by new piano scores by Neil Brand which sound quite robust and clean. I'm no music expert, but I enjoyed all three scores quite a bit. Eclipse rarely includes extras but we do get the usual (and always excellent) one-page liner notes by Michael Koresky who has been a marvelous guide through these Eclipse releases for some time now, so three cheers to you, sir! Each disc is stored in its own slim keepcase with all three cases fitting into the cardboard sleeve with graphics for the Eclipse Series. Next time your movie-loving friend tells you Ozu always filmed at “tatami level” and hardly ever moved the camera, you can just say “Oh, really?” and point him or her to these three films (or, really, most other Ozu silent films). “Walk Cheerfully” is good but not Ozu at his finest while “That Night's Wife” and “Dragnet Girl” are pretty marvelous. Just sit there and smile while thinking about a young, eager Ozu digging and living out the dream as an up-and-coming talent in an industry he would soon come to define. And a young pre-stardom Chishu Ryu appears as an extra “Policeman” in the last two films, though this partially face-blind reviewer must admit he didn't quite catch him the first time through.